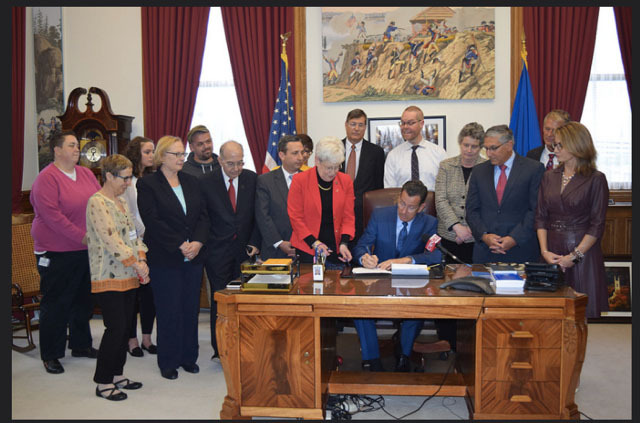 Update: Governor Malloy has signed An Act Concerning The Protection of Youth from Conversion Therapy into law! This legislation will make Connecticut a safer and more welcoming place for LGBTQ youth. The Senate voted today to pass HB 6695, AAC The Protection of Youth from Conversion Therapy by a unanimous bipartisan vote of 36-0. Sponsored by Senator Beth Bye and Representative Jeff Currey, the bill has 100 co-sponsors and was approved in the House by an overwhelming margin last week. Under the bill’s provisions, any licensed health professional who practices conversion therapy would be subject to discipline by the Department of Public Health up to and including the loss of their professional license. Governor Dannel Malloy signed the bill immediately after the Senate vote. Connecticut joins California, Illinois, New Jersey, New Mexico, Oregon, Vermont and Washington DC in banning the harmful and discredited practice.